Complete all-in-one ERP solution for your business needs. 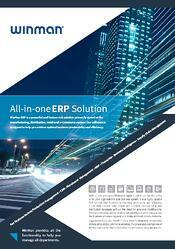 WinMan ERP is a highly scalable and leading class business solution. With a wide range of features it is an ideal all-in-one ERP software for a wide range of industry sectors. Download our product overview brochure to find out more.